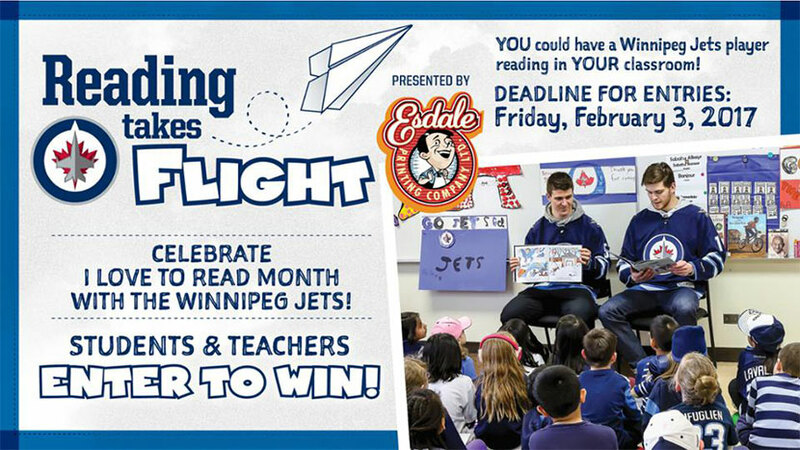 The Winnipeg Jets, in support of I Love to Read Month in February, are once again proud to offer Reading Takes Flight. Presented by Esdale Printing, the program positively encourages children to develop an interest in reading. Students and teachers in Winnipeg and surrounding area can enter for a chance to host a member of the Winnipeg Jets for a classroom visit on Wednesday, Feb. 8, 2017. The winning entries will be chosen based on an entrant’s list of top five reasons why a Jets player should read to your class. Contest submissions can be made by visiting http://www.winnipegjets.com/readingtakesflight. Submissions by individual students or as an entire classroom will be accepted starting today until contest closing date on Feb. 3, 2017. Winners will be announced on Feb. 6, 2017. During school visits, players will be reading the official Winnipeg Jets children’s storybook “The Home Team”. In addition to the visit, each school will receive an autographed replica jersey from the visiting player as well as an autographed book for each student and each classroom involved. There are also a number of prizes to be handed out along with a short autograph session for the participating students.